BBOI project aims to break the limitations of aggregating hundreds of functionalities into large scale photonic circuits boosting the complexity of photonic architectures well beyond the state of the art, but without increasing power consumption in proportion. A full-optioned multifunctional silicon photonic platform will be developed integrating on board novel sensor and actuator technologies for a reliable real-time monitoring, tuning and reconfiguration of the circuit behaviour. BBOI success will make photonics to penetrate deeply in various ICT areas where conventional technologies are approaching their performance limits. PICs4All aims to increase the impact of photonics and enable access to the advanced photonic integrated circuit (PIC) technologies for academia, research institutes, SMEs and larger companies. This will be achieved by establishing a European network of Application Support Centres (ASCs) in the field of PIC technology. The main task of the ASCs is to lower the barrier to Researchers and SMEs for applying advanced PICs, and thus to increase the awareness of the existence of the worldwide unique facility provided by JePPIX www.jeppix.eu (InP and TriPleX PIC design, manufacturing, testing and packaging). 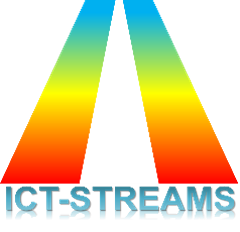 ICT-STREAMS is an industrially driven research and innovation project with ambitious, but specific and well-defined technical objectives, designed to deliver on the promise of solving the pressing interconnections needs of data center architectures at the server blade level. The project consortium has been selected so as to include the entire technology development chain, comprising a high quality blend of strong Industrial and academic organizations. EM LEADERS is a scholarship programme for students and researchers/professionals on Undegraduate, Masters, Doctoral, Post-Doctoral as well as Academic and Administrative Staff members from South-East Asia to European Union and vice versa.EM LEADERS is offering mobility opportunities of high quality students, emerging, early stage and established researchers and administrators. The main areas of interest – Electrical, Electronics engineering and Information and Communication Technologies, Photonics, Biomedical Engineering, Computer Engineering, Power systems and energy, Informatics, Communication Engineering and Microwaves. EM INTACT is a scholarship programme for students and researchers/professionals on Bachelor, Masters, Doctoral, Post-Doctoral as well as Academic and Administrative Staff members from Regional Asia to European Union and vice versa. The main areas of interest are the STEM Disciplines (Science, Technology, Engineering and Mathematics) but with specific priorities for researchers in Electrical & Electronic Engineering; Information and Communication Technology; Photonics; Biomedical Engineering; Computer Engineering; Energy and Power Systems; Informatics; Telecommunications; Mathematics; Physics. Mobility of high quality students, emerging, early stage and established researchers and administrators into Europe from the East-Asia region. The main areas of interest – Electrical, Electronics engineering and Information and Communication Technologies, Photonics, Biomedical Engineering, Computer Engineering, Power systems and energy, Informatics, Communication Engineering and Microwaves.